Audi Q7 Performance, Engine, Ride, Handling | What Car? Even the less powerful 45 TDI version of the two 3.0-litre V6 diesel engines delivers smooth, gutsy acceleration. Mind you, the 278bhp 50 TDI isn’t much more expensive and is far punchier, particularly at low revs. Acceleration builds strongly from just 1500rpm, making the Q7 effortless to drive briskly. Around town, you barely need to brush the accelerator pedal – although lag from the automatic gearbox is much more noticeable with this set-up. Despite the eco focus and additional weight of the batteries, the Q7 e-tron plug-in hybrid has similar performance to the 268bhp diesel. If anything, it feels even quicker when its batteries are charged, thanks to the instant oomph provided by the electric motor. Both feel slow next to the mighty V8-powered SQ7, though; the way this range-topping model builds speed frankly has to be experienced to be believed. Indeed, the only issue we found with any of the cars was with the eight-speed automatic gearbox that comes as standard with 45 and 50 TDI engines. Tuned to maximise emissions savings, it can be reluctant to change down at times, even if you give it plenty of gas. That can be hugely frustrating if you're going for a gap in the traffic or planning a last minute overtake. The standard suspension is a touch firm around town, but at high speed, the ride only jars if you hit a particularly sharp bump. We still recommend an upgrade to the optional air suspension if you're tempted by the Sport trim – it transforms the Q7 into not only the best-riding car in its class but also one of the best in any class or budget, period. Air suspension comes as standard on the S Line. Black Edition and Vorsprung trims have a 'sports' version of the air suspension system as standard. Given that it lowers the ride height by 15mm, it shouldn't come as a surprise that it doesn't deliver as comfortable a ride as the regular air suspension. That said, it's still relatively supple compared with rivals such as the BMW X5, which is made even more impressive when you consider that the Vorsprung comes on massive 22in wheels. The SQ7 also has a form of air suspension as standard, but it’s a bespoke S set-up that's firmer still. Even at speed, you’ll feel a little more disturbance as surface imperfections are transmitted through to your seat. The SQ7 is still more comfortable than many other seven-seat SUVs, but it isn't the best choice if comfort is your top priority. 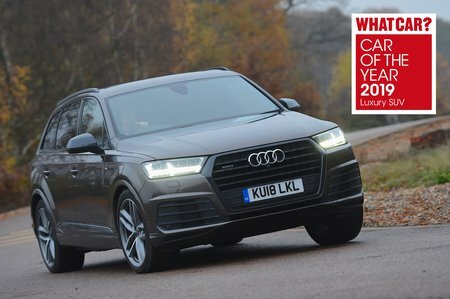 There’s plenty of grip and the four-wheel-drive system offers lots of traction on greasy roads, but the Q7 isn't particularly entertaining to drive quickly compared with sportier rivals, such as the BMW X5 or even the Volvo XC90. That cushy suspension allows quite a bit of body lean through corners, making the Q7 feel a bit ponderous and unwieldy, and the e-tron's additional weight only exacerbates this. It’s still far more agile and better tied down than the Land Rover Discovery, though. The SQ7, which will get a facelift in late 2019, is an entirely different animal. It has a bespoke air suspension system and clever anti-roll bars that limit body lean. For such a big thing, it stays incredibly upright in corners, allowing you to cover ground at an astonishing speed. Meanwhile, the steering is accurate, even if it doesn't stream lots of feedback to your fingertips. Only when starting from cold do you hear a distant background clatter from the 3.0-litre diesels, and that quickly fades once they're up to temperature. Otherwise, you only really hear the engines under hard acceleration and they’re smoother and more pleasant-sounding than the engines in any of the Q7’s rivals – especially the four-cylinder XC90. The Q7 also does a great job of isolating occupants from engine vibration. Naturally, the e-tron is even more hushed when running in electric mode. When its diesel engine does kick in, it does so in a refined manner, with little vibration reaching you or your passengers. The SQ7 hides the fact it’s a diesel very well, too, emitting a muscular woofle – especially in Dynamic mode. There’s no manual gearbox option; just an eight-speed auto that changes smoothly up and down through the ratios. At speed, the gearbox disengages the engine and allows the Q7 to freewheel if you back off the accelerator. This is intended to benefit fuel consumption, but reduces noise, too. On 19in and 20in alloys, there’s very little road or suspension noise. 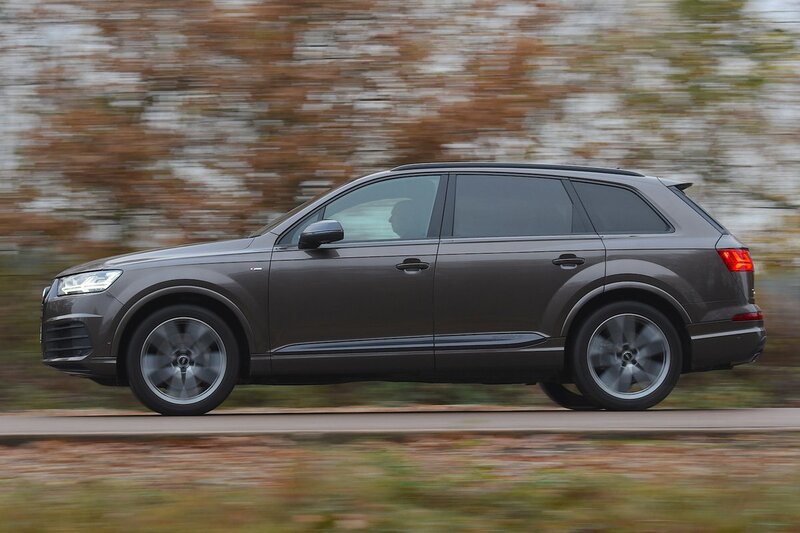 Saying that, even on the 21in wheels, the Q7 is pretty quiet. Wind noise is very well suppressed, even at motorway speeds.